UCCFS: Pizza vs Fondue Round 1 – I Love It Spicy! The Showdown kicks off with the number 1 seed Pizza vs the 16th seed Fondue. Think of each category in the most fondest way possible. You do not have to think of pizza as NY style or Chicago style or Sicilian with or without toppings. You imagine your pizza the way you love it most. Then you do the same for fondue. Whether it be cheese, chocolate or as a main course with seasoned oils and various meats, seafood, or just veggies. Think of these two comfort foods in the best way and decide which is your favorite and VOTE! Cheese fondue with Red Savina hot sauce – what else? Lou Malnati’s pan pizza with sausage and pepperoni on a buttercrust! Hands down the best pizza in Chicago! It kicks the crap out of fondue! Pizza, all the way! Although, I do loooooooove Fondue. 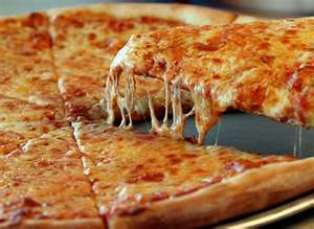 You really can’t beat pizza, that will always be my favorite. Whoa! Passow, time to sink your pennies into that idea. Cleveland’s Fon Pazzows! Passow’s Fondue Pizza! Whether it is thin, thick or pan, veggie, meat or plain, dunk it once, twice or thrice, Fon Pazzow’s will make your experience a fonduzzi™ of a good time. Chef, send me over some, I am still not convinced that Chicago pan pizza can even compare to a delicious slice of NY style pizza. I will post another one tomorrow at 5am.